Car companies like Mercedes-Benz, BMW and Mazda are already investing resources in developing vehicle to vehicle (V2V) communication systems. The U.S. Department of Transportation is also doing research on V2V systems which is looked at becoming an important tool in reducing road-traffic accidents. One such system based on similar principles is the See-Through System (STS) which uses low-latency video streaming and dedicated short-range communication (DSRC) to aid drivers get a better view of the road ahead. The video below explains how. STS uses cameras mounted on the front of a vehicle and streams these images to other vehicles through DSRC, which is a wi-fi-like protocol. There are a few components of the system which need to be installed in cars for this to work. So, say you are tailing a bus on a narrow single-lane road. With STS, passing the bus will be done as follows. Cameras mounted on the front of the bus will transmit video to your car's windshield which has a transparent screen mounted in it. 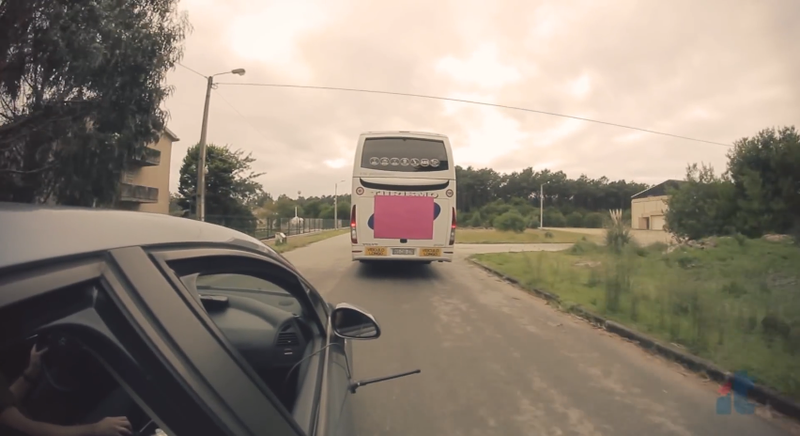 With the help of the video being streamed to a small area on your windshield, you will be able to visualize the road in front of the bus, thereby helping you make the move to pass the bus at the right time. Developers say future display screen incorporation into windshields will be more seamless, making viewing possible as if it were a head-up display or augmented reality view.